(Left) Azeem Khan, a 2002 graduate from NIU with a bachelor’s degree in Business Management and an Associates in Accounting. Azeem founded AK Custom Homes in 2007 to fulfill a life–long dream to start his own family business and become a luxury real estate home developer. As president of the company, he is responsible for all phases of construction, including overseeing all design specifications and monitoring building quality and services. Azeem is also a licensed real estate broker with The Khan Group . He handles all the marketing and sales for the company’s listings including land acquisition and new construction home sales. 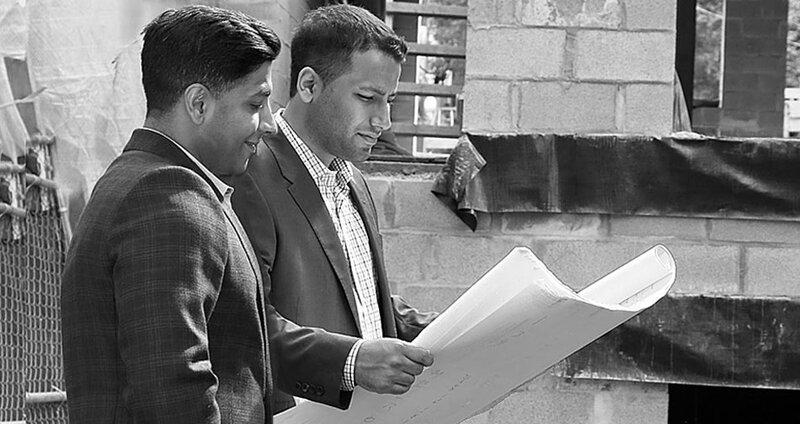 Azeem takes pride in working directly with homeowners throughout the entire build process. In his free time He also enjoys contributing to many local schools and youth organizations along with serving on the board for a very successful non for profit organization he helped start “the CYI” which helps assist in funding after school tutoring to several public schools. Azeem also has a great passion for sports and helps coach youth baseball and basketball. (Center) Raheem Khan, vice president of AK Custom Homes since 2011, is well versed in all process and operational functions of the company. He is a graduate of DePaul University with a dual degree in real estate and finance. He brings many years of wealth management and real estate trend analysis experience and expertise to bear on the financial and budget planning aspects of all AK Custom Homes construction projects. Also, as the operations manager, Raheem keeps things running smoothly between title companies, contractors and vendors. Raheem is a member of the Chicago Association of Realtors, Illinois Association of Realtors, Illinois Association of Realtors, National Association of Realtors.